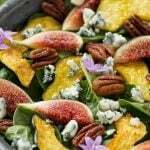 A fig salad full of spinach, figs, blue cheese, roasted acorn squash and candied pecans, all tossed in a balsamic dressing. A unique fall salad option! There’s not much better than fresh figs, and they’re definitely the star of this loaded salad. I make this fig salad year round, and when figs are out of season, I substitute in pears for an equally delicious result. I think that figs may be my absolute favorite fruit. Part of the appeal is that they’re one of the few fruits left that are truly seasonal so it’s a treat when the figs start popping up in the stores. I saw these giant containers of figs at the store and knew that I’d better buy them before they were gone – and the store actually sold out of them by the next day, I guess there are a lot of fig lovers around here! 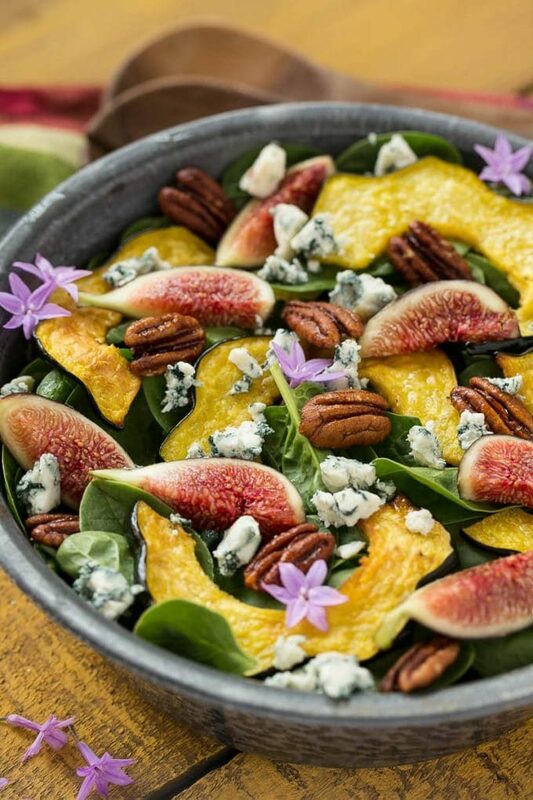 This fig spinach salad pairs the delectable fruit with roasted acorn squash, candied pecans and blue cheese for a healthy dish that’s sure to become a fall favorite. How do you make fig salad? This is a super simple recipe – the only real prep work is roasting the squash. The squash gets cut into thin slices and roasted in the oven until it’s caramelized. Did you know that you can eat the skin of the acorn squash? It’s totally edible and it saves a lot of time in trying to peel that funny shaped thing! If you’re not into acorn squash, butternut will also work well. The roasted squash and figs will go on a bed of spinach, along with some blue cheese and candied pecans. See those purple flowers? They’re GARLIC flowers. I put them there for photography styling purposes and let me tell you, they let off quite an aroma onto the salad. I wouldn’t recommend adding the flowers unless you happen to be a food photographer – they’re pretty to look at but not so pretty to eat. ANYWAYS. I went with a honey dijon balsamic vinaigrette to finish off this fig spinach salad. The dressing takes about 3 minutes to put together, just pour the ingredients into a jar and shake! 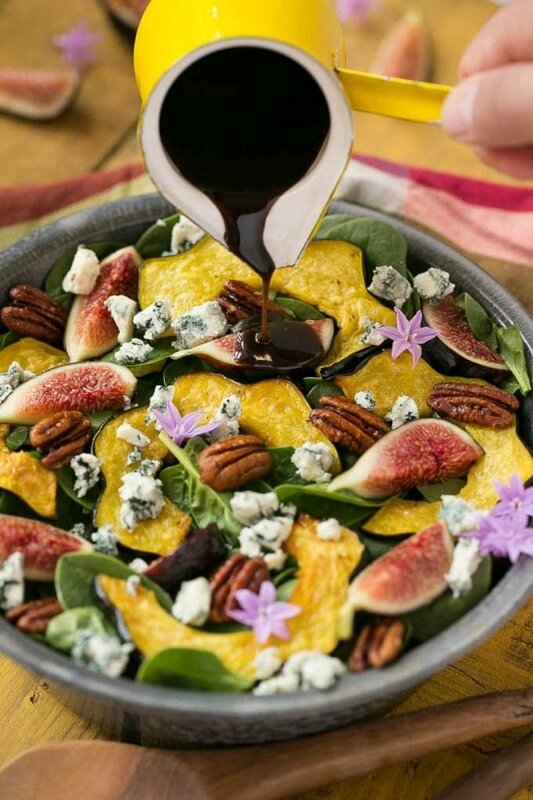 The balsamic pairs wonderfully with the figs and the crunch of the nuts and saltiness of the blue cheese add a nice contrast. I’m going to be soaking in fig season for as long as it lasts. Hopefully some day the little fig tree in our yard will produce more than 2 figs at a time so that I can have my own personal stash. In the meantime I’ll keep hunting for them at the store and enjoying them in this salad. In a small container combine the balsamic vinegar, dijon mustard, 1 tablespoon of olive oil and 1 teaspoon of honey. Season generously with salt and pepper. Whisk to combine or put a lid on the container and shake vigorously. Preheat the oven to 400 degrees. Line a baking sheet with foil and coat with cooking spray. Cut the acorn squash in half and remove seeds. Slice the squash crosswise into 1/2 inch thick slices. Lay the squash slices in one even layer on the baking sheet. Drizzle with 1 tablespoon of olive oil and 2 teaspoons of honey. Toss the squash to coat evenly in the honey and olive oil. Season generously with salt and pepper. Roast the squash for 20-25 minutes, until squash is tender and browned. Remove from oven and cool until slightly warm or room temperature. 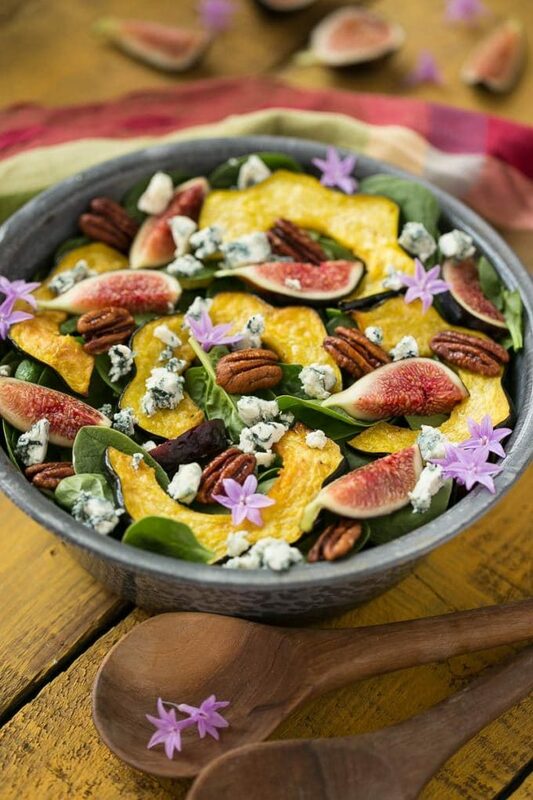 Place the spinach in a large bowl, top with figs, squash, pecans and blue cheese. Pour the dressing over the salad and toss. Serve immediately. Make Ahead: The squash can be roasted a day in advance and the dressing can be made up to 3 days in advance. This is a wild salad! I love the candied pecans. I skipped the squash and the salad came out great. This is such a beautiful salad, Sara! I just made a fig salad recently with caramelized oranges and I’ll never go back! LOVE figs in salads! Adding the flowers was so worth it! Even if the salad tasted terrible. These are honestly the most beautiful pictures I’ve ever seen of a salad. I don’t even like veggies but that salad is calling my name! What a gorgeous salad! I notice that you left the peel on the squash. Was that for photographic purpose? Acorn squash peel is thin and edible! I just can’t get over how incredibly gorgeous this salad is! Beautiful shots! I bet this tastes just as good as it looks! This is beyond gorgeous! 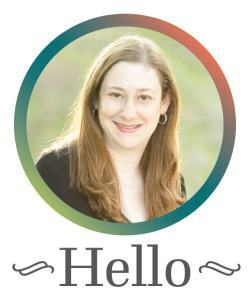 Love the figs…I need to use those more! Too pretty! This looks delicious – but really I just want to put a big bowl of it on the table and stare at it! SO pretty!! seriously, this is the MOST gorgeous salad – and I;m not even a big fig fan, but I would dig right in!! What a beautiful salad! The flowers made me laugh. The things we’ll do to get a beautiful photo! Lol! What a gorgeous salad! I love all the colors and those little purple garlic flowers, I will have to give those a try! I absolutely adore figs! I totally know what you mean about food styling and then it’s not so good to eat! The garlic flowers paid off though. Photos are beautiful! 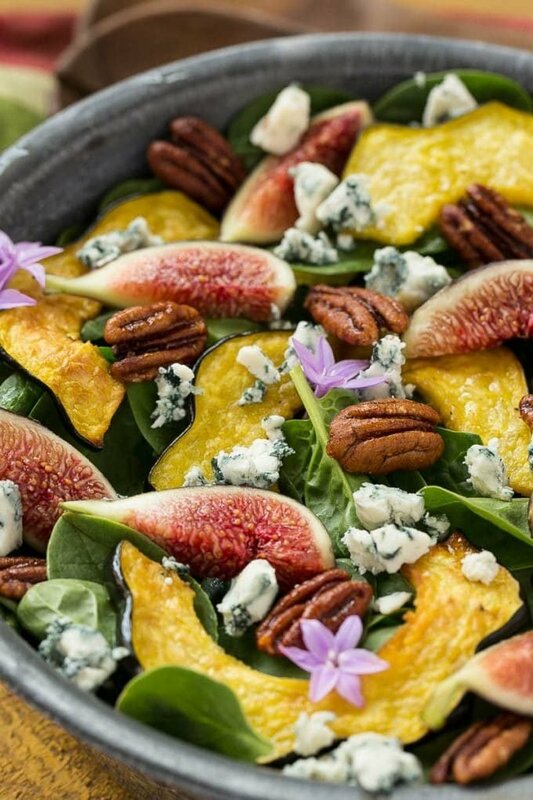 I love figs and this salad is gorgeous. Can’t wait to make it! Oh, this looks so yummy and colorful! !